Ask fellow campers about "Hearthside Grove Motorcoach Resort" and nearby attractions. I have been planning to visit this park for years after seeing their magazine in 2014. 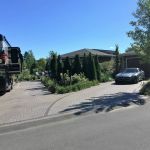 This is a buy your site operation with prices for high-end totally built out sites with a car garage selling for $750,000. They have a clubhouse, pool and tennis courts. The sites are very generous and the majority of motor homes are those priced in the very high six figures and many in the seven figure range. All that and you still have to take your garbage to the dumpsters! Our site was spacious with a paver base and full hookup. A very nice park to visit but not my idea of the perfect concept of motor homing. We camped at Hearthside Grove Motorcoach Resort in a Motorhome. WOW!! Everything was fabulous - staff, grounds, sites. This is an ownership park but you can also rent. We had site 51 which was a forward pull-in . . . perfect for more privacy and we were facing the trees and the area that had the outdoor furniture. Wonderful location to see all the sites - Mackinac Island, Petoskey, Charlevoix, Harbor Springs etc. If we didn't live all the way out west we would consider buying here as the area and this park are gorgeous. We camped at Hearthside Grove Motorcoach Resort in a Motorhome. Outstanding Park, extremely clean! Great weather when we were there. We are from the south, had heard a lot about this park! Soooooo fun! Plenty to do. We played goofy golf for the first time in years and had a blast. Very relaxing. A Must SEE & DO! We camped at Hearthside Grove Motorcoach Resort in a Motorhome. We were here several months ago in August. Loved it! I highly recommend it! Most relaxing place we have stayed! This is a LUXURY motorcoach resort for Class A coaches only. The park is mostly full of lots that are owned by coach owners but some rentals are available. The park is first class in every respect with 2 club houses, a pool and beautifully landscaped lots (many on ponds). Without a doubt, this is the best motorcoach resort I've ever seen anywhere. Renters are allowed to stay in the park for a maximum of 3 weeks at a time. We camped at Hearthside Grove Motorcoach Resort in a Motorhome. 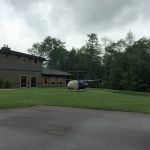 The park is located on the north side of Petoskey and is very convenient to Charlevoix, Bay Harbor, Boyne City, Walloon Lake and Harbor Springs. The things to do in this area are endless during the summer months. This is the perfect summer destination if you like to be active, eat at great restaurants, have wonderful weather and/or just relax. Absolutely beautiful resort. We were in Phase 5, which is more like a residential neighborhood than an RV resort, per se. The bunkhouses in this part of the resort appear to be 1000 sqft or more, and the lots they sit on are exceptionally spacious. The main clubhouse is the best we've ever encountered. In our experience, this is a unique venue. Frankly, it is over the top in terms of luxury. With that as the background, there were a couple of things we found odd and out of place. At the top of the list would be the fact that you have to transport your trash and garbage to dumpsters located behind the clubhouse. This is the only top tier resort we have found that in. Secondly, the original clubhouse situated near the entrance is the location of the pool and spa. The pool is smallish, and the spa was warm, not hot. Other than that, there isn't much to gripe about here. We camped at Hearthside Grove Motorcoach Resort in a Motorhome. There is a wonderful bike trail across the main road from the resort. You can bike for miles and miles and see some gorgeous scenery. Nice facility and very friendly staff. Site was very plain with only a small table and two chairs. For the price, we were a bit disappointed. Cable requires their cable box, so all TV's had to receive the same channel. Park was secure and clean. We camped at Hearthside Grove Motorcoach Resort in a Motorhome. We are on a 6 month journey across the US. We stayed only 2 nights of our 8 night stay. On the second day as we were making breakfast there were several people on our site. When we asked what they were doing, the Resort Person told us the site was for sale and he was showing it. No warning at all about this when we made the reservation or when we checked in. To top that, the Resort Person became aggressive with this language and told us if we didn't like it we could leave. Very, Very unprofessional. The internet is a total joke, we were able to use it for one day before they started to slow our band width to a crawl. We were only checking email and searching the web, no streaming. Extremely disappointing for the amount we paid for this site. Cable tv requires extra equipment to use. Frustrating. Hearthside requires you to take you garbage to the dumpsters yourself. Even KOA picked up the garbage. Again for the price you are paying, this is very disappointing. We have stayed at several high end RV Resorts. Although it is beautiful here at Hearthside, we had to cut our stay short because of the lack of privacy with the showings. If you decided to stay here, make sure you get a site that is not for sale!! We camped at Hearthside Grove Motorcoach Resort in a Motorhome. Beautiful place. Huge concrete sites full of Prevosts and Newells, but they don't pick up the garbage and cable TV requires their special equipment. Office staff is excellent. They are building out more sites so you will get a sales pitch or two. Owners here are not very friendly. Probably worth staying here once, but we will stay someplace cheaper next time. We camped at Hearthside Grove Motorcoach Resort in a Motorhome. I will keep this short, my family of five stayed here and we're treated wonderfully! Grounds were incredible. And service even better. They even loaned us a car to go into town. They helped with the fire pit, and the outdoor kitchen was ridiculous! It was immaculate! Thanks Hearthside Grove for the great family memories....that beats anything I could buy my kids! We camped at Hearthside Grove Motorcoach Resort in a Motorhome. This is a beautiful resort. The sites are huge and surrounded by grass. The check in person was efficient and helpful. The guide who lead us to our site was very friendly and also very helpful. Used the workout facilities. Although not a lot of equipment, it is top quality and adequate. The owners in the park are very friendly. Many stopped to say hello as they walked by. Salesman came by but was not pushy at all. Great place to spend a few nights or an entire summer! We camped at Hearthside Grove Motorcoach Resort in a Motorhome. This was our second stay at this resort & we love it. Very clean, large sights with a lot of very nice landscaping. This is an ownership par but they do rent. A very social group with lots of social activities encouraged. It's a bit pricey but the nicest RV resort we have ever stayed at. We camped at Hearthside Grove Motorcoach Resort in a Motorhome. Tosci Sand on M119 is a a great place for wine and spirits. A Olsen's a mile & 1/2. Many miles of paved bicycle paths very nearby. This is truly a Resort with a capital R! It is immaculately landscaped with lush trees, lawn, water fountains and gardens. The lots are for sale so many of them have been finished with bungalows, fireplaces, outdoor kitchens, etc. The residents are very welcoming and friendly, and the sites are huge. If you want a vacation from your typical campground, this is the place! We camped at Hearthside Grove Motorcoach Resort in a Motorhome. Our large beautiful pull in site overlooked a pond and everything was perfect. Lots of grass and pavers. Beautiful landscaping. Very quiet. There are lots of amenities including a full size movie theatre showing first run movies for free. We have been to many RV resorts and this one tops the list! It is located between Petoskey & Harbor Springs in the most beautiful part of Michigan. We camped at Hearthside Grove Motorcoach Resort in a Motorhome. Lunch or dinner at Legs Inn is a must! Historic restaurant with delicious Polish food and a scenic drive to get there. Obviously this is a beautiful resort, well maintained, landscaped, easy in and out. Sites were beautiful and level with full hookups. Our cable didn't work but they had some contraption that we could use. But we worked with our satellite. Without the coupon this place is very expensive and some of the "owners" can be a bit stuffy, asking us not to walk on the grass. But all in all we enjoyed our stay, the area is just beautiful and convenient to so many things. We would come again during the off season. We camped at Hearthside Grove Motorcoach Resort in a Motorhome. Convient location from town. Gated entrance. What a special and beautiful place. Best campground we have stayed at. Friendly workers. We stayed five nights and although most of the campground was empty (late in season) we really enjoyed our stay. The grounds, facilities, and landscaping were beyond first class. This facility deserves a 15 rating it is that special. We camped at Hearthside Grove Motorcoach Resort in a Motorhome. Are you affiliated with Hearthside Grove Motorcoach Resort ?